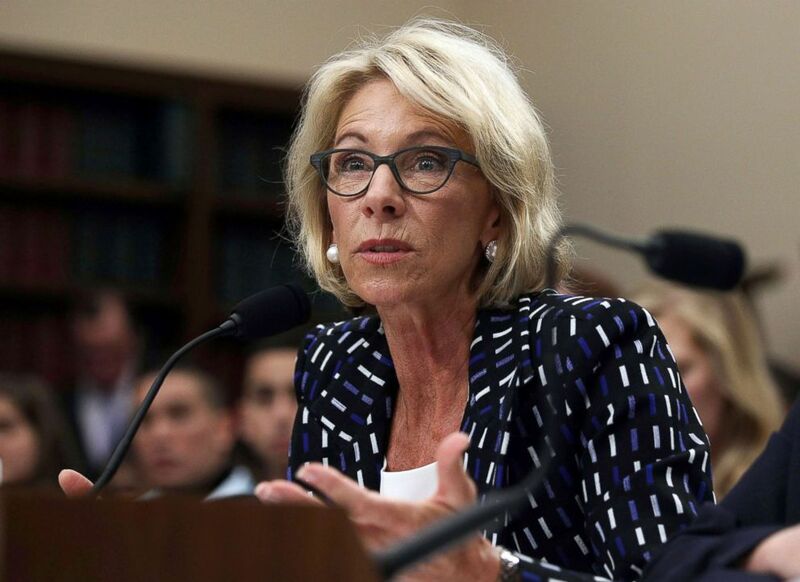 In the wake of controversial comments during a recent television appearance, Education Secretary Betsy DeVos sought Tuesday to further clarify her stance on school choice. In an interview aired Sunday on CBS's 60 Minutes, DeVos struggled to explain how diverting money from underperforming schools to fund charter schools improved public education in her home state of Michigan. Asked if the public schools in Michigan performed better after she advocated for school choice there, DeVos answered, "I can't say overall that they have all gotten better... I hesitate to talk about all schools in general because schools are made up of individual students." In a tweet Monday, she noted that Michigan's 4th grade math and reading test scores have fallen below the national average. Incredulous critics have questioned how the data supports her argument that school choice boost performance. But Tuesday, she suggested the scores have fallen because "Michigan hasn't embraced further reforms and hasn't yet offered parents robust choice." "States surrounding Michigan offer parents more choices and see improving student achievement," she argued at a National PTA conference in Arlington, Virginia. "There are some who say that choice takes money away from school buildings, from school systems. But money doesn’t belong to buildings or systems. Taxpayer money belongs to you." In the same conference, she also alluded to arming teachers, something she's grappled with since suggesting schools have "the option and the opportunity" to do so in the wake of the Parkland shooting four weeks ago. "We must improve physical security at our schools. This includes assisting states to train specially qualified school personnel on a voluntary basis," Devos said. "These highly specialized courses prepare school staff to respond to incidents."